Chimurenga is a cultural platform for writing, art, and politics founded by Ntone Edjabe in 2002. From its Cape Town offices, Chimurenga pursues a pan-African perspective through a range of endeavors, including: the African Cities Reader, a biannual publication that taps into urban life on the continent; Pilgrimages, an editorial project that paired fourteen African writers with guides in fourteen African cities in 2010; and the Chimurenga Library, an online archive of pan-African, independent periodicals. 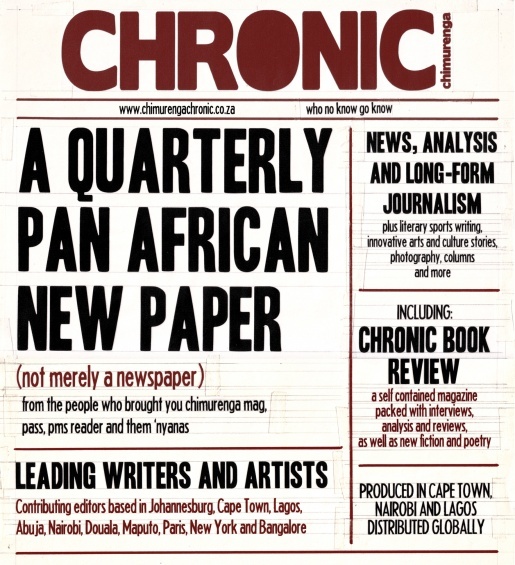 Chimurenga’s most recent project is the Chimurenga Chronic, a quarterly gazette that intervenes in the coverage of current events and perceptions of progress across the continent. Its title not only suggests an abbreviation of “The Chronicle,” a common naming convention for newspapers, but also signals a recurrence or temporal lag that distinguishes its close-to-the-ground coverage of politics, health, the economy, sports, arts, technology, and more. In March 2013, Stacy Hardy of Chimurenga will research and develop groundwork for the group’s project in New York. While here, she will also present a lecture, introducing Chimurenga, their work, history, and current projects. Hardy’s presentation will be accompanied by lively readings and discussions by New York–based Chimurenga contributors Vivek Narayanan (poet and editor of Almost Island), Sean Jacobs (Chronic sports/gaming editor and editor of the blog Africa is a Country), and Harmony Holiday (poet and choreographer).